40 Days for Life: Discover What God Has Done...Imagine What He Can Do ("True stories from the Movement that is changing hearts and saving lives on prayer at a time") Published by Cappella Books 272pp hardback. the link will take you to Amazon.uk where the book is £13.12 and Kindle edition £4.99. 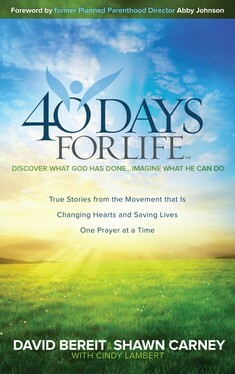 Alternatively you can order the book via the 40 Days for Life website.